There are not many ammo companies that load match grade ammo for the 30-06 and so it is nice to see SIG jump on board. We especially approve of their use of the 175gr Sierra Match King bullet over the 168gr SMK that Federal uses with their 30-06 Gold Medal Match load. 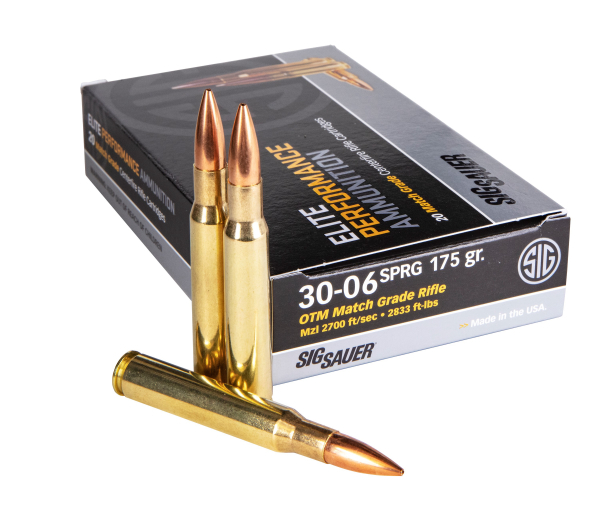 The SIG load launches that 175gr projectile at 2700 fps, which is the same velocity as the Federal load and as such the better 175gr bullet will outperform the Federal load at long distances. The .30-06 is capable of even better velocity while still maintaining accuracy, so we are still a little disappointed, but it should still be a good load. Hopefully accuracy is high. The .30-06 has a lot of sniping history and has a lot of capability as well. Though the 300 Win Mag dominates the 30 cal mid range sniping realm, the 30-06 is still a good lower recoiling alternative. It also does well with 190gr and even 208gr bullets.